Could we see a return of Beast from the East in Hastings and Rother as temperatures look set to plummet. 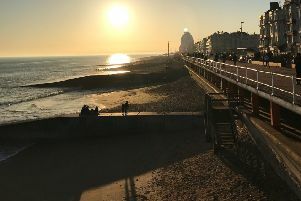 Temperatures are set to plummet this week as a blast of Arctic air crosses the UK bringing to an end what has been a mild start to the new year. After a mild Monday and Tuesday, temperatures are expected to fall to freezing overnight from Wednesday for much of the country, and could plunge as low as -5C with winds coming from the east. SEE ALSO: Hastings man avoids jail following domestic violence assault. Scotland and the North West are expected to bear the brunt of the icy weather but is unlikely the South East will escape the cold. The Met Office forecast the weather will be windy on Wednesday with rain moving south-eastwards. It is then predicted to get colder but brighter, with widespread frost and wintry showers in the north-east. Friday could bring thickening cloud and outbreaks of rain. It is expected to remain mainly cold, unsettled and sometimes windy thereafter, according to the Met Office. Average daytime temperatures in the south of England will struggle to rise above 6C. While this is the average temperature for January, the sharp change in temperature will be noticeable. See also: Dog owners in Hastings enjoy dressing up their dogs to take part in national event. Watch our video. See also: St Leonards girl aged 15 in court for being drunk and disorderly in public.